Many bands have gone the branded booze route, but not Korn. They've gone ahead and launched their own branded coffee (sorry, Koffee). 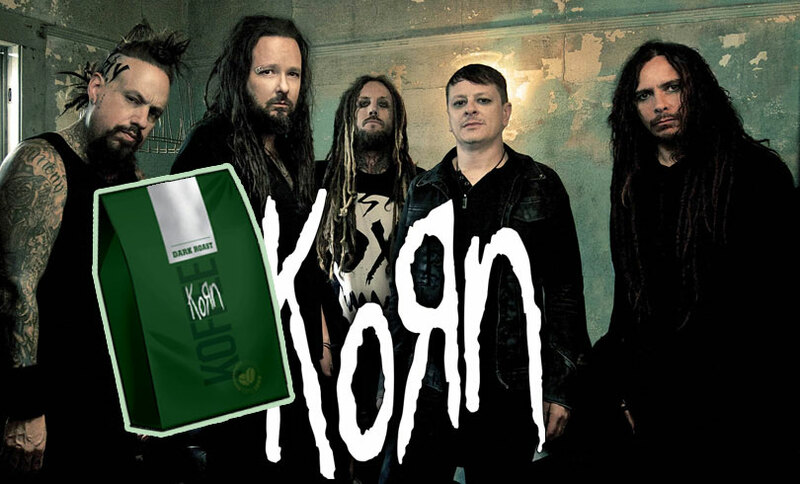 Korn has announced today's launch of their new coffee brand, Korn Koffee. Created in partnership with J. Gursey Coffee Roasters, Korn Koffee is available now. Made entirely with Certified Fair Trade whole beans, Korn Koffee is a distinctive blend of Ethiopian Yirgacheffe, Guatemalan Huehuetenago, and Organic Peru beans mixed with J. Gursey Coffee's popular Vintage Black Diamond blend. Korn personally curated the creation of Korn Koffee, a process that saw the band members tasting multiple variations before ultimately selecting the perfect roast and blend. Indeed, each bag of Korn Koffee will feature a special message from Korn: "After almost 25 years of touring, making records and playing in front of all of our amazing fans (you), one thing has remained a constant in our daily routine: coffee. The ritual, the brew, the aroma and most importantly, that very first cup every morning that sets the tone, is something we look forward to every day. Because of our passion, we've gotten together with a roaster and handcrafted our very own blend of Koffee. We hope you enjoy, share, and join us in savoring many cups of Koffee for years to come." A bag of their dark roast is available for pre-order at the online Korn store for $14.99.